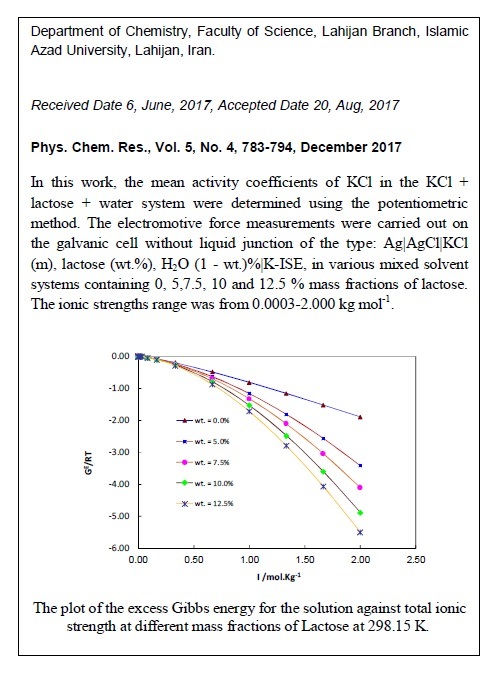 In this work, the mean activity coefficients of KCl in the KCl+lactose +water system were determined using the potentiometric method. The electromotive force measurements were carried out on the galvanic cell without liquid junction of the type: Ag|AgCl|KCl (m), lactose (wt.%), H2O (1−wt.) %|K-ISE, in various mixed solvent systems containing 0, 5,7.5, 10 and 12.5 % mass fractions of lactose. The ionic strengths range was from 0.0003 to 2.000 kg.mol−1. The modeling of this ternary system was made based on the Pitzer ion-interaction model. 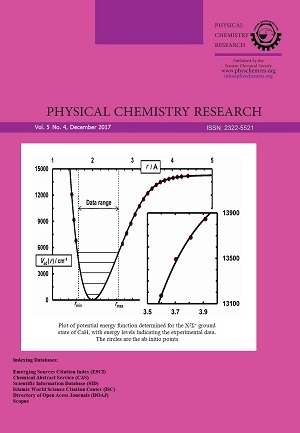 The mean activity coefficients were correlated with Pitzer model and the adjustable Pitzer parameters (βo, β1 and Cø) were determined for the series under investigated system. Then, these parameters were used to calculate the amounts of thermodynamic properties such as osmotic coefficients and excess Gibbs free energies for under investigated systems. The results clearly indicated that a good correlation was obtained with the Pitzer model to describe this system.